Recognize and celebrate the high performance flexible work success that already exists in the culture, as well as identify gaps to close and roadblocks to overcome as part of the transformation process. Engage and research at all levels. Guided by our principles-based culture framework, we learn from employees, teams, line managers and leaders. We research the technology capabilities, workspace options (on and off-site), performance management and leadership supports that are available. A clear “from-to” strategic plan that doesn't reinvent the wheel. It leverages and builds upon what is already working in the culture to unlock the power and potential high performance flexibility. It identifies what’s missing and what needs to change at the individual, team, manager and organizational levels to achieve success. A compelling, strategic “why,” coupled with a clear path for implementation, will motivate people to invest time and effort in the high performance flexible work culture change process. Make the case and provide the roadmap. We answer the question: how will your business and people benefit (e.g. talent management, workspace redesign implementation, productivity and process improvement, cost savings, etc.)? Then our culture change process provides a step-by-step roadmap to achieve success in an organized, measureable way. Senior leaders, line managers, teams and individuals align behind a meaningful, shared vision of a high performance flexible work culture in action. They move forward with confidence because they understand the steps and the guardrails that guide the transformation. People learn by doing. Help senior leaders, line managers, teams and employees embrace the mindset shifts and behavior changes that translate the principles of a high performance flexible work culture into action, and do it in a way that makes sense for the unique realities of a particular job and business. Show don’t just tell. After all levels are trained in new ways to think, behave and coordinate in a high performance flexible work culture, everyone collectively participates in a facilitated, six-week period of active experimentation to jumpstart the momentum of transformation and identify gaps in real-time. Momentum and understanding. At the end of the six weeks, the organization determines how to continue to build on positive momentum initiated during pilot and to work on the areas that require continued focus to achieve success. Continue to reinforce the ways of thinking, behaving and coordinating that sustain the high performance flexible work culture in the busy, day-to-day reality of competing demands. Celebrate success, refresh the skills and tools, and support continual improvement. A high performance flexible work culture is never “done.” We work with the internal team responsible for ongoing oversight and implementation to develop a plan to sustain the transformation. 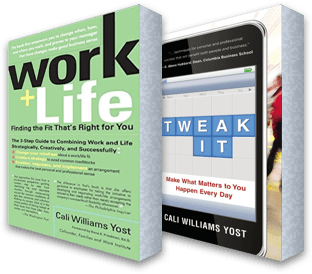 Impact is optimized as individuals are reminded how to take control and leverage work flexibility, technology and workspace options to get the job done and manage life, productively. Teams continue to coordinate how, when and where they work, effectively and efficiently. And managers have the support they need to clarify what’s expected and ensure goals are met. Adapt and adjust to changing realities in a thoughtful, deliberate manner when and if work flexibility, technology and workspace options are no longer being used in a way that benefits the business and/or its people. Rethink how, when and where work is done to align with the new set of realities—at the individual, team and manager levels. Because “Recalibrate as Realities Change” is the fifth principle of a High Performance Flexible Work Culture, it is understood by everyone upfront. We help you build on what’s working. Adapt and adjust what is not. You won’t throw the flexibility “baby out with the bathwater” when business realities change and you won’t make headlines, like Yahoo and IBM. Instead of a radical, all-or-nothing response, problems with flexibility in the way work is done are recognized and resolved, early and collectively, as they emerge.